The past week has gone by quickly, but it has been a good week. I managed to finish the A-Z April Blogging Challenge, and plan to write the relection post tonight or in the morning. I have also managed to Write or edit for at least five hours five days a week. I took Friday off, because I had eye surgery that morning. After a self-indulgent day of listening to audio-books, I was feeling much better yesterday, and have worked more than fifteen hours between yesterday and today. The plan for the sabbatical was to do the boring stuff first so that I would build steam rather than run out before the time was over. To my surprise, I have dived into checking citations and fixing footnotes that I have not had the patience to address for months. I am even taking great pride in proofreading. The new short-term goal (Find the most efficient, and least obtrusive organization for the sabbatical space) needs some refinement, so I will amend it to Spend one hour the next four days finding and implementing efficient organization for the sabbatical space. I am also going to add another task, Read criticism one-half hour a day. I am stunned, but very grateful, that I am enjoying these nuts-and-bolts tasks. I hope everyone has a wonderful week. Please visit the other RoWers here; at the hashtag #row80, or in the FB group. Although I may seem over-confident, I am checking in today, my sabbatical has started, and I think that I can keep up with check-ins for a while. Goal One, done. My A-Z blogging challenge got off to a rocky start, when I wavered about doing it this year. However, after catching up by C or D, I hit the mark all the way to Z. I’m looking forward to writing the reflection post next week. Sunday and Monday were still under the old Write or edit for at least two hours five days a week goal. Although I spent about four hours packing my former office on Sunday, I also spent two hours transcribing notes. Monday was blessedly less busy than last week, with only one short work meeting, and a couple of staff wanting to say goodbye, which was nice. I managed to get in two hours as well on Monday. Tuesday was the first day under the revised Write or edit for at least five hours five days a week goal. It took some time for IT to move and set up my computer in the office I am borrowing for the six month sabbatical. 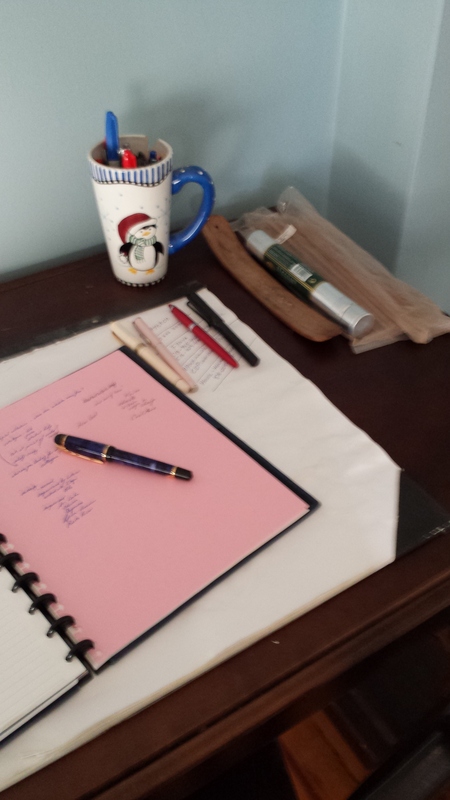 I also spent some time to move the books and pens and other writing accoutrements. Even so, I managed to edit for five hours, despite there being no chair (!) in the borrowed office. Today, I wheeled my chair from the former office to the borrowed office, sat down, and sighed contentedly. I have done at least five hours today, and plan to go back to it after I finish this post. And the last goal is also accomplished. Plan the move into the sabbatical space, for at least an hour a day for the next ten days, can now change to a short-term goal: Find the most efficient and least obtrusive organization for the sabbatical space. Have a productive rest of the week, everyone. Visit the other RoWers in the FB group or here. The old saying, pride goeth before a fall seems relevant at the moment. I did not post last Wednesday, the first check-in I have missed since I started this Round. Why did I miss it? The major reason was last week was off the rails. Everyone at work suddenly realized I was going to be gone May 1st, and panicked. I had back-to-back meetings last Wednesday from 9am through 4:30pm, with a 20-minute break. Someone actually asked to meet with me in that 20-minute stretch, but I took joy in telling them I planned to eat lunch and I was not going to meet during my lunch. Even so, I was completely exhausted, and couldn’t even muster the strength to put a comment on FB. I fell short of the Work toward more consistency in my check-ins goal. However, I did post T-Y in the A-Z blogging challenge this week. I looked at my draft for Z, and decided that I needed to find a different subject for Z. I wrote the post yesterday, and it is scheduled to go up tomorrow. Therefore, I did meet the goal: Post the A-Z blog challenge posts. Despite the ridiculous work week, and a day spent in medical appointments, I continued transcribing handwritten notes into the sabbatical project, meeting the Write or edit for at least two hours five days a week goal. As for the goal, Plan the move into the sabbatical space, for at least an hour a day for the next ten days, I finished that packing last week, and got most of the packing for the permanent move done as well. I am going to my office today to finish up what is not going to the sabbatical space. Finally, I will be able to increase my writing goal on May 1 to Write or edit for at least five hours five days a week. Have a lovely week, everyone. Please visit the other RoWers here or in the FB group.